Resource Conservation and Recovery Act (RCRA)A 1976 amendment to the first federal solid waste legislation, the Solid Waste Disposal Act of 1965. In RCRA, Congress established initial directives and guidelines for U.S. EPA to regulate and manage solid waste, including hazardous waste. RCRA established a regulatory system to track hazardous substances from the time of generation to final disposal. The law requires safe and secure procedures to be used in treating, transporting, storing and disposing of hazardous wastes. RCRA was designed to prevent new, uncontrolled hazardous waste sites. Corrective Action activities at the Pacific Gas and Electric Company (PG&E) Topock Compressor Station (Station) and Topock Project Site (Site) are also subject to the California Environmental Quality Act (CEQA)A law mandating review of environmental impact of governmental action. 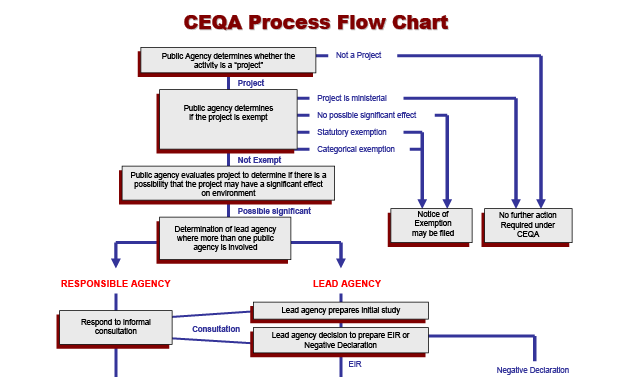 It requires that public agencies study the significant environmental effects of proposed activities and that the public be informed and allowed to comment on project decisions.. CEQA is a state law that requires the lead agency to analyze and disclose to the public all potential environmental impacts that could result from agency-approved cleanup activities, unless the activities are exempt from CEQA. As the lead agency, the Department of Toxic Substances Control (DTSC)The department within the California Environmental Protection Agency in charge of the regulation of hazardous waste from generation to final disposal. DTSC oversees the investigation and cleanup of hazardous waste sites. maintains primary responsibility for compliance with CEQA. In early 2004, DTSC determined that immediate action was necessary at the Site, as a precautionary measure, to ensure chromiumHexavalent chromium is a form of chromium. Chromium is a metal naturally found in rocks, soil, and the tissue of plants and animals. Hexavalent chromium can be found naturally at low concentrations, but it is also used in industrial products and processes and is a known carcinogen. On May 28, 2014, the California Department of Public Health adopted a new California drinking water standard at 10 parts per billion for hexavalent chromium.-contaminated groundwaterWater beneath the Earth’s surface that flows through soil and rock openings (aquifers). does not reach the Colorado River. Based on the need for immediate action, DTSC issued a Notice of Exemption under CEQA for the initial and the expanded Interim MeasuresCleanup actions taken to protect public health and the environment while long-term solutions are being developed.. The CEQA Notice of Exemptions for Interim Measures (IM) 2 and IM3 are available on the CEQA Documents for Interim Measures page of the Document Library. Prior to approval and implementation of a final groundwater remedyThe final cleanup action proposed for managing contaminants at a project site. at the Site, a Final Environmental Impact Report (EIR)A report designed to examine the potential environmental impacts of proposed activities. was prepared to determine if any significant impacts would potentially occur as a result of the proposed final groundwater remedy. The EIR provided a Project-level analysis for the conceptual technical methods proposed for the final groundwater remedy to clean up contaminated groundwater at the Site. The groundwater EIR also provided a program-level analysis of the construction of physical facilities that would be necessary to implement the proposed Project. DTSC determined that the preparation of a Subsequent Groundwater EIR is required to evaluate potential environmental impacts resulting from design details of the selected groundwater remedy (In situ TreatmentTreatment of contamination in place. with Freshwater FlushingMoving of fresh water through the well system to push the plume through an In-Situ Reduction Zone located along National Trails Highway.) that were modified since the approval of the conceptual Groundwater Remediation Project in the 2011 Final Groundwater Remedy EIR and the 2013 Addendum to the EIR. After PG&E developed an implementation plan (or Remedial Design Documents) for the proposed final groundwater remedy, including specific design of remediation facilities within a discrete footprint within the Site, DTSC evaluated the design as part of the Subsequent EIR to determine if the environmental impacts associated with the design are generally consistent with the significant conclusions of the 2011 certified final groundwater EIR and the 2013 Addendum groundwater EIR. DTSC provided opportunities for stakeholders and the public to get involved in the Subsequent Groundwater EIR preparation process. In May 2015, DTSC issued a formal NOP to prepare a Groundwater Remedy Subsequent EIR (SEIR). Two scoping meetings for the preparation of the SEIR were held in May 2015. Comments received were incorporated into the draft Subsequent EIR. On January 12, 2017, DTSC posted a notice to the public of the availability of the draft SEIR, a 47-day public comment period and two open house/public hearings on the Draft SEIR. Comments received during the January 12, 2017 through Februry 27, 2017 comment period were responded to and incorporated into the Final Subsequent EIR for the Groundwater Remedy, which was certified on April 24, 2017. In November 2012, DTSC issued a formal Notice of Preparation to prepare a draft soil EIR for the Topock Compressor Station Soil Investigation Project. A series of three EIR scoping meetings were held in December 2012 to inform the public and receive comments on the proposed scope of work, schedule, and methodologies that were used in preparing the soil EIR. The draft soil EIR was released for public comment from July 7 through September 5, 2014. The work plan evaluated in the draft soil EIR is the Soil RCRA Facility Investigation/ Remedial Investigation (RFI/RI) Work Plan (Soil Work Plan) that was submitted on January 14, 2013. The Soil Work investigation focuses on areas requiring further investigations and supplemental soil sampling. Additionally, some areas would be investigated using geophysical methods to identify subsurface objects for further investigation. The draft soil investigation EIR also considered potential impacts from some possible pilot studies that might be necessary to support the Corrective Measures Study/Feasibility Study for soil remediation. The Biological Section of the Draft Soil EIR was recirculated for public comment by DTSC. The public comment period was from April 15 to June 1, 2015. DTSC responded to all comments received and incorporated the responses into the certified Soil EIR and approved the Soil Work Plan on August 24, 2015. The results of this investigation will be reported in the RFI/RI Volume 3 (Soil) Report and will present a combined data set of all soil investigations. View the certified Final Soil EIR and the approved Soil Work Plan and the Data Gap Work Plans in the Document Library. DTSC will ensure that all necessary steps are taken to comply with CEQA and RCRA. For additional information on the CEQA process, please visit the California Resources Agency and the Governor's Office of Planning and Research websites. If you have questions about the Topock Groundwater EIR, the Subsequent Groundwater EIR, the Soil EIR, or other aspects of the Project, please contact one of DTSC's Project staff listed on the Contact Us page of this website. You can view the 2011 Final EIR for Groundwater remedy, the Soil Final EIR, the NOP for the groundwater remedy SEIR, Final SEIR, and other CEQA documents, as well as other Project documents in the online Document Library or in the Project's Information Repositories.